Will this be ZTE's American breakthrough? Last year, ZTE surprised us with the Axon, an all-metal Android phone with surprisingly high-end specs for just $450. But while it was a noble attempt at an affordable flagship, we had issues with its slightly chunky design and lack of storage. Enter the Axon 7, ZTE's follow-up that once again aims to take on much more expensive Android phones. It has a luxe-feeling unibody metal case, loads of storage options and a sharp 2K display. And best of all? It's still just $450. As soon as I picked up the Axon 7, it felt familiar. Between the slightly curved edges of its 5.5-inch display and its unibody case, I could have sworn I was holding my iPhone 6S instead. It feels natural in your hand, even more so than HTC's 10. 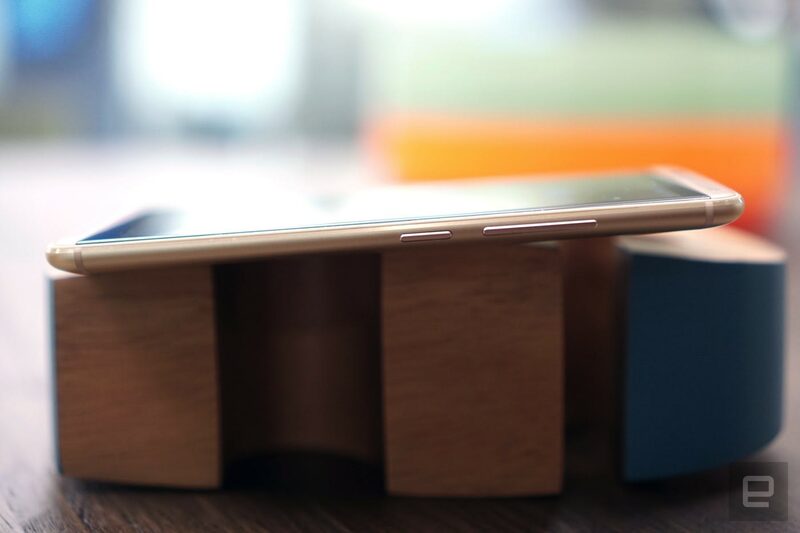 Speaking of HTC, the Axon 7 also shares a few design elements from the One series, from its rear antenna bands to its stereo front-facing speakers. At this point, every phone manufacturer takes a bit of inspiration from the competition (even Apple), so I'm not knocking ZTE. Part of the credit for the Axon 7's design goes to BMW's Designworks, a renowned design firm that's developed things like insane computing accessories for Thermaltake, a bobsled for the U.S. Olympic team and even BMW's own X Series vehicles. The Axon 7 is the group's first phone design, but you wouldn't be able to tell by looking at it. 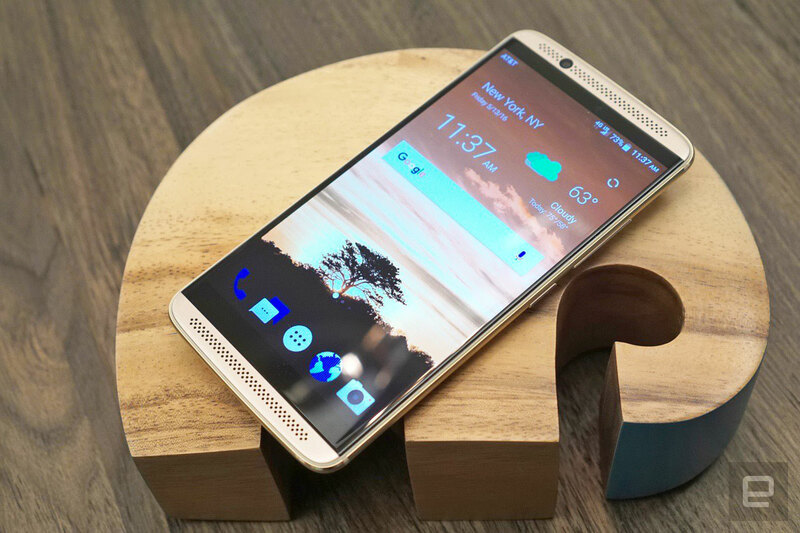 Under the hood, the Axon 7 is running a Qualcomm Snapdragon 820 processor at 2.2GHz, 4GB of RAM and 64GB of storage. You can also add a microSD card for up to 128GB of additional storage. Altogether, it's a huge improvement over the mere 32GB of non-upgradeable storage from the previous Axon. There's also a fingerprint sensor on the phone's back, which at this point is pretty much expected. Eventually, ZTE plans to release a $639 version of the phone with 6GB of RAM, 128GB of storage and a pressure-sensitive screen (similar to Apple's 3D Touch technology). It'll have a walnut "composite material" case option, but otherwise the company didn't have much else to say about that device yet. While the Axon 7's screen is still 5.5 inches, it beats out its predecessor's 1080p display with a quad-HD (2560 x 1440 pixel) resolution, and it also uses AMOLED instead of LCD. In typical usage you probably wouldn't notice a huge difference, but ZTE says it also built the phone with Google's Daydream VR platform in mind. Since VR pretty much requires low screen persistence (basically, incredibly fast refresh rates and low response times), they had to go with an OLED screen this time around. It'll also launch a ZTE VR headset alongside the Axon 7. The Axon 7 packs in a 20-megapixel shooter on its back (with optical image stabilization and a F/1.8 lens for solid low-light performance) and an 8-megapixel camera on the front. It can shoot 4K video at 30FPS, and and 240FPS slow motion at 720p. As for those dual stereo speakers, they sounded even louder than the Boomsound offerings I've heard from HTC. There was a loud corporate event happening right near my briefing with some ZTE reps, and the Axon 7 had no trouble playing music loud enough to drown out that noise. Once again, there's also a high-quality DAC inside the phone supporting 24-bit/96kHz audio. ZTE also packed in Dolby Atmos headphone support, which gives you a few ways to hear audio in virtual surround sound. ZTE isn't saying when the Axon 7 will be available yet, but we expect to hear more soon. For now, it's an intriguing curiosity. It could end up being a solid competitor to the Galaxy S7 or HTC 10 this year. And while it's more expensive than the beloved OnePlus 2, it still packs in plenty of value compared to most other flagship phones.